This simple Paleo cookie recipe is really easy, only has 4 ingredients, and tastes delicious. Nuts contain phytic acid which can bind to minerals in the body and make them unavailable and inhibit digestion. When almonds and other nuts are soaked the phytic acid is deactivated. It is more expensive, but it is better to use raw, soaked almond butter, which is listed below. 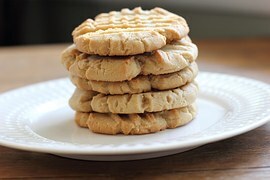 This Paleo almond butter cookie recipe is simple and delicious. 1 cup of Almond Butter (I recommend this one). Thoroughly mix the almond butter, egg, honey, and stevia, if you are using it, until smooth. Place one spoonful of cookie dough per cookie 2 inches apart. Flatten each cookie with a fork.